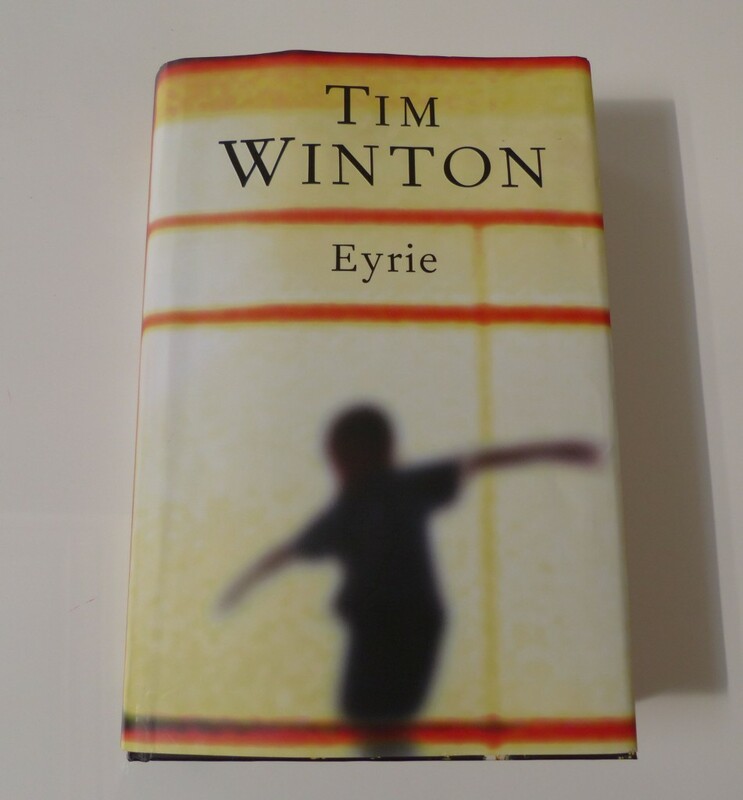 It’s an impossible task – sitting down at one’s computer trying to write about Tim Winton’s latest novel, Eyrie. I’ve been staring at the blank page for hours, contemplating how to do such a book justice. Much has been said already and far more eloquently that I could ever hope to express. But persist I will, because as we hurtle into the holiday period, I know many of you will be looking for something new to read at the beach or on a plane. Time is of essence, so you need to choose wisely. Read something entertaining but also worthwhile. Something that will resonate and stir the soul, take you away from trashy tabloid mags and cheap reality TV. 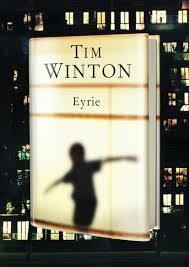 Tim Winton’s latest novel, Eyrie, would be my Number One pick. So where do I begin in explaining why? It’s an epic task. 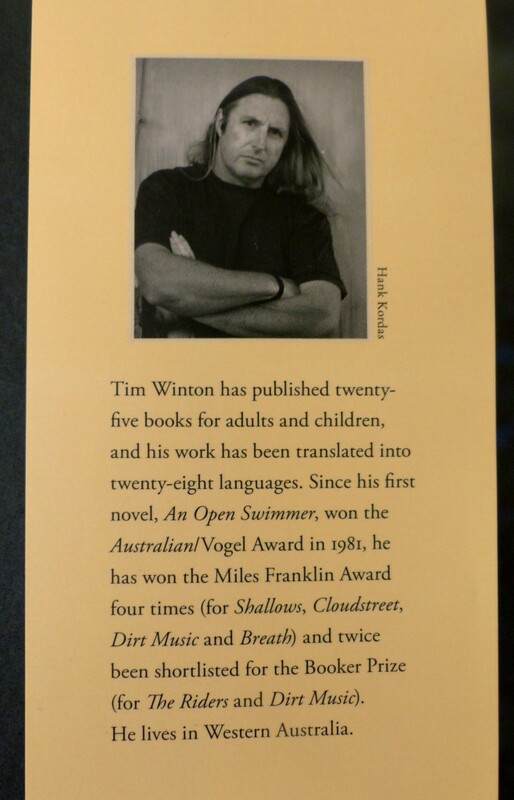 I have to remind myself that Tim Winton himself will not read this. So I shall remove the fear of disappointing so great a mind with my trivial ramblings and chat away. Because a BLOG is not a ‘serious’ book review. It’s more of a friendly natter between pals about something I think you’ll like. For starters, Eyrie is a real page-turner. Not since Winton’s Cloudstreet, have I enjoyed one of his novels as much. Well, hang on, I was fond of Breath, but Cloudstreet was always my favourite. And I think that was because of the characters. Flawed individuals struggling to find a place in the world. It’s a very Australian ‘thing’, isn’t it? Backing the underdog and rooting for any small victories they win along the way. That’s also how I felt about Eyrie’s main protagonist, Tom Keely. He’s down and out, divorced and unemployed and the first time we meet, he’s trying to face the world, suffering a killer hangover. I liked him straight away. There’s also a sense of injustice about his grimy circumstances – how this former environmental activist ended up in a wasteland high-rise. We want to know more about how he got there and if he’ll turn the corner. Keely discovers a neighbour living in his apartment block is an old childhood friend, Gemma Buck. She’s a coarse, flinty former beauty who smokes like a chimney and speaks her mind. Her grandson, Kai, catches Keely’s attention and slowly, he starts to re-engage with the world. When a sinister threat emerges and puts Kai at risk, the action steps up. Keely starts making plans. But I’m not going to give you the whole plot or any real spoilers here. Although I should also mention, as far as one of the central themes goes, it’s Keely’s mother who provides the clues. Doris, is a strong and endearing character who knows her son better than he knows himself. As she tells him two-thirds into the book, ‘To save a drowner, you need to be a swimmer.’ Yes, there’s many characters in this book trying to save others. Doris and Keely’s sister, Faith, are trying to save him from himself, while he tries to save Gemma and Kai. Swimming, surfing, the great Aussie ocean, floating and all things aquatic have always featured heavily in Winton’s writing, and are again present in Eyrie. Although like the title suggests, from living up high in his lofty nest, his ‘eyrie’, Keely has a keen sense of a propensity to fall, a feeling of vertigo that may pull him down to a point where getting up is a questionable possibility. And that is what keeps us, the reader, turning the page, anxious to learn of Keely’s fate. It’s as if Winton is trying to draw his own focus away from the water for a change. So birdlife, flying and falling themes pull us away from the water to a more ‘airy’ level in this novel. Every time I finish a Tim Winton book I marvel at the mind behind the words. It makes you want to know more about the man himself, but in real life, he gives very little away. He leads a private existence and rarely attends public events. Which probably explains how he’s been able to write and publish 25 books. The inside of Eyrie’s cover gives just a brief resume of his vast achievements. Yes, completely overwhelming. He’s won the Miles Franklin Award FOUR times. Enough from me. Read Eyrie instead. If you’d like a copy of your own, order through Bookworld at Bookworld.com.au and by quoting this code – BW-SEO14 – you’ll receive a FIVE PER CENT discount. Enjoy. And if you get time, let me know what you think of the book yourself. This entry was posted in Opinion and tagged author, Breath, Cloudstreet, Dirt Music, Eyrie, Miles Franklin award, Shallows, The Riders, Tim Winton by JenniferHansen. Bookmark the permalink. Glad you agree! Thanks for the feedback Ann – much appreciated. But if you’ve already finished Winton’s book, what will you be reading over Christmas? Could be another tome I need to review… Cheers, Jen.